Beijing, Aug 11: Even the ever-calm Abhinav Bindra couldn’t control his emotions at the press conference following his gold winning exploits at Beijing. “I can’t describe how happy I am,” he said. 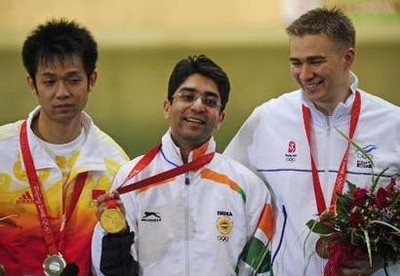 Bindra pipped the likes of reigning Olympic champion Qinan Zhu to grab the gold medal in the 10m air rifle event to win first ever individual gold medal for India. Bindra, who faced criticism for failing to deliver on the great promise he showed as a child, said he was not thinking about making history in India with a first individual gold medal. In fact, he said, he was “not thinking about anything”. His 10.8 of a possible 10.9 on his final shot sparked loud celebrations from group of fans from India. Randhir Singh, Indian Olympic Association secretary-general and a former shooter himself, was present at the range. He admitted being stricken by nerves as the competition reached its climax. “I haven’t prayed so much in my life. With the second last shot they tied together and then he (Bindra) shot a 10.8. It couldn’t have got better,” he told Indian television. On his gold winning pupil he said that Bindra was a very calm and composed person and his focus also rubbed on the other players in the Indian contingent. His views were echoed by Abhinav’s father who also added that God had rewarded his son’s efforts from the past 12 years. President Pratibha Patil Monday congratulated Abhinav Bindra who made history when he won a gold medal for the 10-metre air rifle event at the Beijing Olympics – India’s first individual gold medal in the Olympics. Prime Minister Manmohan Singh and Sports Minister MS Gill also sent their messages. Gill lauded Bindra’s achievement, calling him pride of the nation. “Finally, we got an individual gold last time we saw gold was when the Indian hockey team won it in 1980. Youth in the country got a new icon in him and hope they are drawn more into Olympic sports”. Kalmadi said. “Cricket rules the roost in India but now the youngsters have a role model who plays some other sport. It augurs well for us,” he said. “It was a proud moment for all of us here and back home. To see the Indian flag being raised and the national anthem being played made us feel proud of our country. It’s an unforgettable moment,” he added. This is a step forward and I hope we would have more athletes who would emulate Bindra,” Kalmadi added. The BCCI also extended their congratulations to him while announcing a cash award of Rs. 2.5 million to the Beijing Olympic gold medallist. “Hearty congratulations to Abhinav Bindra for winning India’s first-ever individual gold medal at the Olympics. He has done the country proud. His achievement heralds a new era for Indian sport,” BCCI President Sharad Pawar said in a statement. Meanwhile, a further windfall awaits Bindra on his homecoming. The Punjab government has pledged a sum of Rs 1 cr for Bindra, while the Chattisgarh and the Maharashtra government have set aside a sum of Rs 1 lakh and 10 lakhs respectively. Railway Minister Lalu Prasad Yadav will present Bindra with a railway golden pass. The Bihar government has also declared a prize of Rs 11 lakhs for Bindra. According to legend, the ancient Olympic Games were founded by Heracles (the Roman Hercules), a son of Zeus. Yet the first Olympic Games for which we still have written records were held in 776 BCE (though it is generally believed that the Games had been going on for many years already). At this Olympic Games, a naked runner, Coroebus (a cook from Elis), won the sole event at the Olympics, the stade – a run of approximately 192 meters (210 yards). This made Coroebus the very first Olympic champion in history. Approximately 1500 years later, a young Frenchmen named Pierre de Coubertin began their revival. Coubertin is now known as le Rénovateur. Coubertin was a French aristocrat born on January 1, 1863. He was only seven years old when France was overrun by the Germans during the Franco-Prussian War of 1870. Some believe that Coubertin attributed the defeat of France not to its military skills but rather to the French soldiers’ lack of vigor. * After examining the education of the German, British, and American children, Coubertin decided that it was exercise, more specifically sports, that made a well-rounded and vigorous person. His speech did not inspire action. 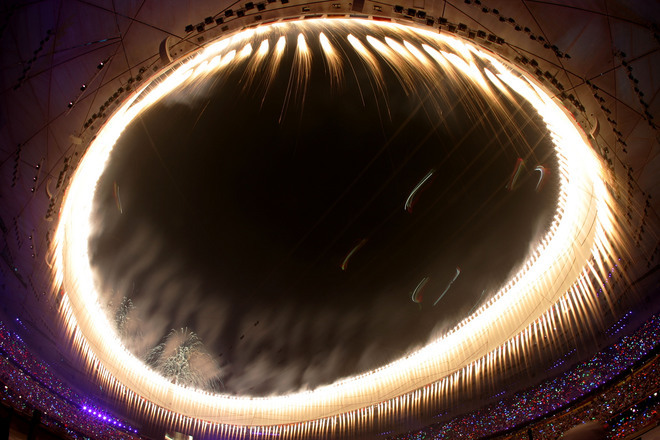 Though Coubertin was not the first to propose the revival of the Olympic Games, he was certainly the most well-connected and persistent of those to do so. Two years later, Coubertin organized a meeting with 79 delegates who represented nine countries. He gathered these delegates in an auditorium that was decorated by neoclassical murals and similar additional points of ambiance. At this meeting, Coubertin eloquently spoke of the revival of the Olympic Games. This time, Coubertin aroused interest. The delegates at the conference voted unanimously for the Olympic Games. The delegates also decided to have Coubertin construct an international committee to organize the Games. This committee became the International Olympic Committee (IOC; Comité Internationale Olympique) and Demetrious Vikelas from Greece was selected to be its first president. Athens was chosen for the revival of the Olympic Games and the planning was begun. Pole vaulting, sprints, shot put, weight lifting, swimming, cycling, target shooting, tennis, marathon and gymnastics were all events at the first Olympics. The swimming events were held in the Bay of Zea in the Aegean Sea. Gold medalist, Alfred Hoyos Guttmann described it: “I won ahead of the others with a big lead, but my greatest struggle was against the towering twelve-foot waves and the terribly cold water.” (Guttmann, pg. 19) Approximately 300 athletes participated, representing thirteen countries. * Allen Guttmann, The Olympics: A History of the Modern Games (Chicago: University of Illinois Press, 1992) 8. ** Pierre de Coubertin as quoted in “Olympic Games,” Britannica.com (Retrieved August 10, 2000 from the World Wide Web. http://www.britannica.com/bcom/eb/article/2/0,5716,115022+1+108519,00.html).